After ten years of fighting in the Trojan War and another ten years traveling the Mediterranean, Odysseus is finally home in Ithaca. kingdom and its wealth, he comes disguised as a beggar in order to anonymously assess the state of affairs and test Penelope’s love and faithfulness. Arriving home in his beggar’s disguise, Odysseus is greeted warmly, welcomed by Penelope, who has been forewarned that her visitor possesses exceptional intellect and wit and is likely a match for her own erudition. She has been told that he has information about Odysseus, having met him in Crete. They begin a highly coded conversation filled with oblique references and word play that slowly peels back the layers of disguise and shows Penelope to be a strong and wily challenger, Odysseus’ equal in mental agility. 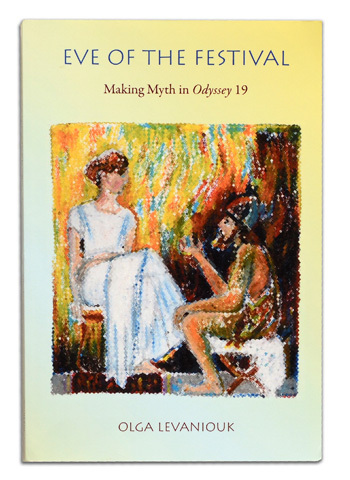 The very structure of Eve of the Festival: Making Myth in Odyssey 19 by Professor Olga Levaniouk mirrors the elaborate process of unveiling the truth between these well-married people. Professor Levaniouk explores allusion and illusion, word play and dream interpretation and defines a code perhaps common to every married couple. The seven artists whose work is pictured in this section each have, in varied and inventive ways, introduced code as a deciphering tool in ferreting out the meanings of a book.